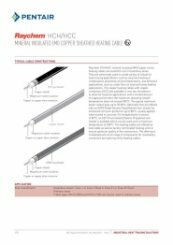 Raychem HCH/HCC mineral insulated (MI) Copper series heating cables are suited for use in hazardous areas. They are extensively used in a wide variety of industrial heat-tracing applications, such as long line heating or condensation prevention at low temperatures, and domestic applications, such as under ﬂoor or road and ramp heating applications. 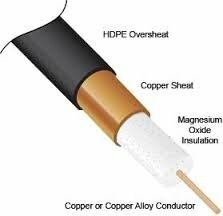 The copper heating cables with copper conductors (HCC) are available in very low resistances to allow for long line applications with a limited amount of supply points when the maximum operating sheath temperature does not exceed 200°C. The typical maximum power output goes up to 50 W/m. Optionally they are offered with an HDPE (High Density Polyethylene) over-sheath for enhanced corrosion protection up to 80°C, usually applied when buried in concrete. For temperatures in excess of 80°C, an FEP (Fluorinated Ethylene Propylene) over-sheath is available which can be used up to a maximum temperature of 200°C. The heating cables are offered as bulk cable as well as factory-terminated heating units to ensure optimum quality of the connections. The offering is completed with a full range of components for installation, connection and splicing of the heating cables. Delivery length of bulk cable on coil depends on type of resistance and is limited by max. coil length as indicated in the table on top. Factory terminated elements are limited by a max. weight of 50kg, however to ensure practical and safe on-site handling, it is strongly recommended to limit element lengths to 25 - 30kg. Not all resistances are standard items and as such may not be in stock.